Hello my fellow autograph collectors. 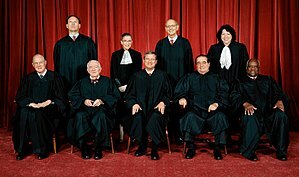 The subject matter for today’s blog is the United States Supreme Court. I will offer some insight as to the signing habits of the Chief Justice and the Associate Justices. Chief Justice John Roberts – He is not an easy signature to get. He will offer an autograph occasionally but not often. Treasure this one if you are lucky to get him. Antonin Scalia – He is one of the most challenging Associate Justices to obtain. He just doesn’t like to sign his name. I have gotten him twice but it wasn’t easy. He loves to chat about the law and engage in a lively debate. Anthony Kennedy – A willing signer as long as it isn’t too inconvenient for him. He is also a very nice person. Clarence Thomas – An amazing signer. I have never seen him turn down an autograph request. He is very gracious and has a great personality. I super nice guy who is very considerate of his fans. Ruth Bader Ginsburg – She is another fantastic signer. She will sign willingly and is very pleasant to chat with. Stephen Breyer – Another very nice man and a gracious signer. This humble man is always willing to sign an autograph for anyone who cares to ask. Samuel Alito – He is a good signer as well. Justice Alito isn’t as willing as some of the others but will sign. I have gotten autographs from him twice and both were great experiences. Sonia Soto Mayor – I have only encountered her one and she was great. She generously signed two items for me. It is my understanding that she isn’t as willing to sign as she once was. Elena Kagan – A very nice person who will sign an autograph without any hesitation. She is also very friendly and engaging. I hope you have enjoyed today’s Supreme Court autograph blog. Feel free to check out my web store www.autographedfirstdaycovers.com. This entry was posted in Uncategorized and tagged Anthony Kennedy, Antonin Scalia, Associate Justice, Clarence Thomas, Elena Kagan, Ruth Bader Ginsburg, Stephen Breyer, United States Supreme Court. Bookmark the permalink.